Peirce identifies inference with a process he describes as symbolization. Let us consider what that might imply. I am going, next, to show that inference is symbolization and that the puzzle of the validity of scientific inference lies merely in this superfluous comprehension and is therefore entirely removed by a consideration of the laws of information. (467). Even if it were only a rough analogy between inference and symbolization, a principle of logical continuity, what is known in physics as a correspondence principle, would suggest parallels between steps of reasoning in the neighborhood of exact inferences and signs in the vicinity of genuine symbols. 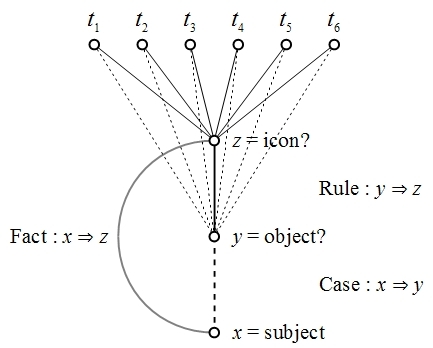 This would lead us to expect a correspondence between degrees of inference and degrees of symbolization extending from exact to approximate (non-demonstrative) inferences and from genuine to approximate (degenerate) symbols. The third and last kind of representations are symbols or general representations. They connote attributes and so connote them as to determine what they denote. To this class belong all words and all conceptions. Most combinations of words are also symbols. A proposition, an argument, even a whole book may be, and should be, a single symbol. (467–468). In addition to Aristotle, the influence of Kant on Peirce is very strongly marked in these earliest expositions. 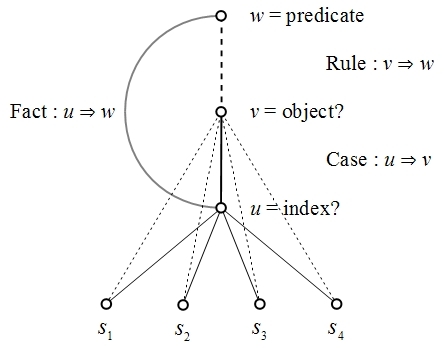 The invocations of “conceptions of the understanding”, the “use of concepts” and thus of symbols in reducing the manifold of extension, and the not so subtle hint of the synthetic à priori in Peirce’s discussion, not only of natural kinds but also of the kinds of signs leading up to genuine symbols, can all be recognized as pervasive Kantian themes. In order to draw out these themes and see how Peirce was led to develop their leading ideas, let us bring together our previous Figures, abstracting from their concrete details, and see if we can figure out what is going on. Figure 3 shows an abductive step of inquiry, as taken on the cue of an iconic sign. Figure 4 shows an inductive step of inquiry, as taken on the cue of an indicial sign.